Probably one I should have written at the start of this year, it’s kinda already half way through the year and I’m already thinking about Christmas lol. BUT, I actually turn 25 in a few months time, so I probably should have given myself a bit more time to prepare for this post and actually do the things I want to do. But I’m on a mad one with keeping myself busy at the moment, so I think it will be OK? As I approach a quarter of a century I am excited at what is yet to come. I don’t know why people dislike growing older, like HEY more life decisions to make, the year I may actually look older than 14 and the promise of a Colin the caterpillar cake, it ain’t no birthday without Colin. 25 seems like more of a milestone than 21 to me, I feel more established, I’m a lot happier in myself than I was 4 years ago and I cannot wait to see what the next few years bring. 1. Learn To Cook – Lol. This is something I’ve been telling myself I’ll do since I went to university, still yet to happen. But I have hope and determination, I have no excuse not to now I don’t have to cook in a kitchen which features the leftovers of a 2am banquet. I’ve created a pinterest board for main meal ideas and I’m setting the target of learning to cook one new meal each week. I’ve already scorched one tea towel and cut into my worktop, so wish me luck. 2. Give Blood – This is something I have wanted to do for ages. It’s always been one thing after another with my health and I’ve only recently got myself back to a healthy weight so I can now give blood. A big shout out to my good friend Ben who gave me the push to donate, I’m going to do my first one next Wednesday and I am both petrified and excited at the thought. Giving blood doesn’t take much time out of your day, but it is a simply amazing thing that can help to save someone’s life. It’s a total yes from me! 3. Do Yoga – 2017 is the year of feeling good about myself, and yoga is something I need to do for both my mind, and to purge for forgiveness for the years I have never stretched before or after exercise. 5. Write A List – But not just any list, a list of more things I want to accomplish before the year is up. I’m in the centre of a big cloud of motivation right now so I want to capture that and set myself some real targets to push myself until the end of the year. 6. Sign Up For A Night Class – I want to learn something new every year, and learning Finnish to a higher standard has been on my new years resolutions for at least 2 years now oops.. Whether it’s a new language or a cooking class, I really want to start upping my game before I turn 25 and investing in myself. 7. Sort Out My Asthma – I sometimes forget my lungs are working at about 30% less capacity than everyone elses as I swim miles during the week and rush around like a headless chicken. I am still yet to find a medication that doesn’t cause my throat to be a b***, but I live in hope. Sorting this out before my 25th is like asking how long is a piece of string? I just hope I’ll get there soon! 8. Get a Macbook – It wouldn’t be a list of mine without a materialistic goal popping up. My current laptop has seen better days, and to up my game both professionally and on my blog I really need a smart, fast Macbook to go with it. All I know is I’m getting the copper one. Obviously. 9. Digital Detox – Shame on me. After I vowed to have more digital detoxes throughout the year I haven’t. I’m not sure I could go a week without it again, but I am definitely going to be fitting in a weekend off it at some point, it will be like I’ve never gone off Instagram, literally. 10. Learn How To Park – Those memes about parallel parking are me, to a tee. I practice every day in my work car park, the perks of turning up 30 minutes early. The reality is I would hit a car if there was one there, but there isn’t, so it’s ok. I need to seriously learn how to reverse into a bay at least. 11. Learn How To Say No More – I don’t just mean about social events, I mean work wise too. I say yes to things which leads to me over committing and working myself to the bone. I need to be realistic and know when to say no. 12. Get My Teeth Whitened – Who doesn’t? Turns out it’s not just tea, coffee and red wine that stains your teeth. Say hello to my Nakd bar addiction that permanently stains my bottom row of teeth. So that’s saying goodbye to nakd bars and getting my teeth looking at in the next 3 months. Ain’t nobody got time for teeth the colour of sweetcorn. 13. Outfit Posts – I’ts been an up and down year for outfit posts on the blog this year as it’s probably been one of the most hectic years of my blogging career. Now the dust is starting to settle, outfit posts are going to be at the top of my agenda soon. Plus, I have plenty of new clothes I need to share! 14. Go Paddleboarding – I need to really start making the most of living by the sea and paddleboarding is at the top of my list and probably one of the only watersports I’ve never done. I’m going to make it happen this summer without a doubt. 15. Go To Paris – Paris has been a city on my to travel list for years, there’s something about the promise of croissants, Parisian style and atmosphere that I just want in on! I’m lucky enough to be going a week before I turn 25, so much excite. 16. 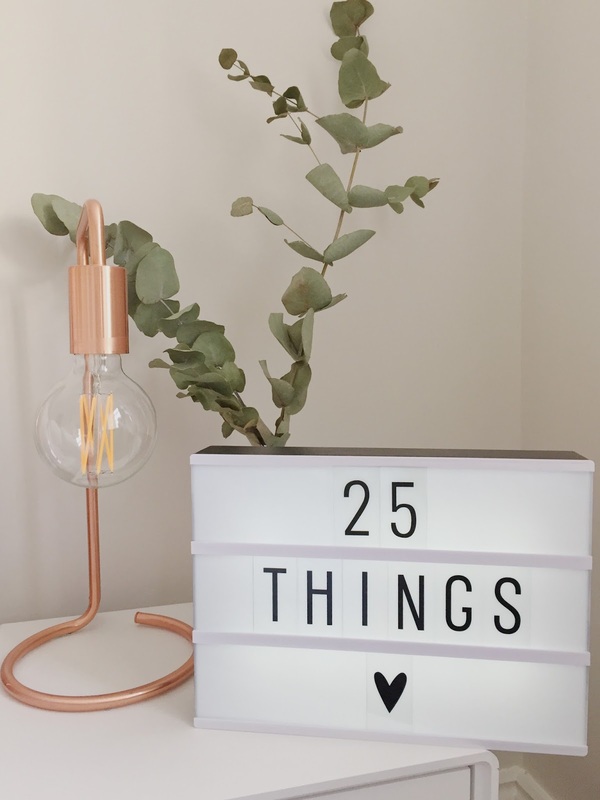 Buy Plants – A trip to the garden centre is desperately needed, I need about 10 more cacti and a few trailing plants that I can add to a copper plant stand. I feel like I’m finally ready to be able to look after something other than myself! 17. Go To Cafes By Myself – I feel like this is on condition of getting a macbook as carrying my heavy laptop with its charger around everywhere is not as appealing. I want to do more things by myself this year and going to cafes is one of them. 18. Have A Clear Out – I’d say that there is still 80% of my clothing left at my parents house that will sit there for an eternity if I don’t do anything about it. I need to be a bit more brutal with stuff I haven’t worn in years so a clear out is definitely needed, and it will all be going to a charity too! 19. Have A Make Your Own Pizza Night – Dominos on a Saturday is standard procedure when James is down, it’s definitely one of the only things I haven’t grown out of since I left uni… A make your own pizza night probably won’t be as tasty, but it will be fun and something a bit different. 20. Meet Up With An Old Friend – Social media means that so many friendships are left untouched for years, it’s like they’re still there so you don’t need to reconnect and meet up with them. Meeting up with an old friend is good for the soul, and it’s normally like you’ve never been apart. More effort is definitely needed! 21. Have A Picnic – I don’t mean some sandwiches and a packet of crisps for a day at the beach. I mean the whole hog. I’ve never done a proper picnic with plates, plenty of snacks and drinks. There’s something a little bit quaint and charming about it and it has to happen! 22. Open Air Cinema – This is something I have wanted to do for sooo long. I usually end up missing out on buying tickets or leaving it too late. I’m planning on going to watch La La Land at Royal William Yard in September and I am very excited! 23. Wimbledon On The Lawn – Royal William Yard have set a screen up for Wilbledon and they’ll even be strawberries and cream on offer at the weekend, it’s something I really wanted to do last year so I’m aiming to have a little watch there this weekend! 24. Learn How To Ride A Bike – I’m really not lying when I say I don’t know how to ride a bike. The last time was probably 20 years ago, with stabilisers. I’d love to be able to ride to work and do a triathlon one day and I’m finally going to make that happen at age 24! 25. Start Vlogging (properly!) – If and when I get a macbook this will make vlogging and editing videos soo much easier! I love the idea of vlogs and the way that blogs are going I think it will be the right time to make the jump. So there we go, 25 things to do in 3 months – let’s do this! Have you done something similar to this? What things do you want to achieve before your next birthday?